Transparency Market Research (TMR) has published a new report titled, “Medical Aesthetic Devices Market - Global Industry Analysis, Size, Share, Growth, Trends, and Forecast, 2018–2026”. 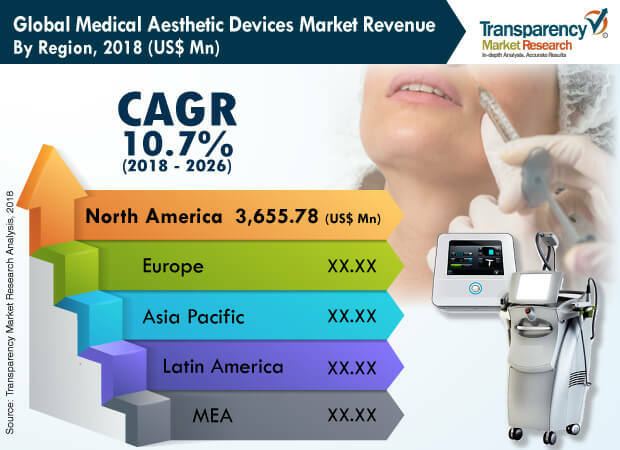 According to the report, the global medical aesthetic devices market was valued at US$ 8,590.02 Mn in 2018 and is projected to expand at a CAGR of 10.7% during forecast period from 2018 to 2026. The global market is anticipated to be driven by technological advancements and increase in incidence of skin diseases during the forecast period. The medical aesthetic devices market in Asia Pacific is expected to expand at a high CAGR due to high population base, increase in disposable income of consumers, easier entry for new local manufacturers offering products at competitive prices, and rise in awareness about aesthetic treatments. Medical aesthetic devices assist in efficient diagnosis and treatment of various skin conditions. Dermatological indications such as pigmented lesions, acne, wrinkles, and vascular lesions. During the 2008–2009 recession, the market was hit hard due to its reliance on disposable consumer income. However, in subsequent years, the market recovered rapidly. Increase in the incidence rate of skin cancer and other skin disorders across the globe is expected to drive the number of patients requiring diagnosis and treatment. Minimally invasive lasers, dermal fillers, and topical product classes were preferred by patients in the last decade. This in turn is expected to increase the uptake of aesthetic devices, thereby driving the market. Moreover, increase in customer preference for aesthetic procedures and their willingness to spend more on these fueled the growth of the global medical aesthetic devices market. According to American Society of Plastic Surgeons estimates, over 15.7 million minimally invasive aesthetic procedures were performed in the U.S. in 2017, an increase of 2% over that in 2016. This indicates high popularity of minimally invasive procedures in aesthetic applications. For minor skin related issues such as unwanted hair, wrinkles, and lines, patients prefer faster solutions with minimal pain that will help them resume work at the earliest. Moreover, introduction of hand-held devices in the microdermabrasion and dermal filler segments is likely to increase convenience for service providers, thereby propelling the uptake of these devices. Globally, botulinum toxin injection and hair removal are the most common minimally invasive and surgical procedures performed, respectively. As a result, the global medical aesthetic devices market is witnessing an increasing trend of product innovation to ensure maximum patient comfort during and after treatment. These factors are likely to drive the global market in the near future. In terms of product type, the global medical aesthetic devices market has been categorized into aesthetic laser & energy devices, skin tightening & body contouring devices, aesthetic implants, and facial aesthetic devices. The aesthetic laser & energy devices segment accounted for major market share in 2017. Utilization of aesthetic laser & energy devices is rising gradually due to the increase in occurrence of skin and aging problems across the world. Based on application, the global market has been classified into facial & body contouring, facial & skin rejuvenation, breast enhancement, scar treatment, congenital defect repair, reconstructive surgery, tattoo removal, and hair removal. In terms of end-user, the global medical aesthetic devices market has been segmented into hospitals, dermatology clinics, and cosmetic centers. Hospitals is the major segment of the market because these are the most favored settings for implantation and offer easy access to physicians. Geographically, the global medical aesthetic devices market has been segmented into five major regions: North America, Europe, Asia Pacific, Latin America, and Middle East & Africa. North America is projected to account for the largest share of the global market during the forecast period, owing to advancement in technology and high adoption of medical aesthetic devices. Europe is anticipated to account for significant share of the global market between 2018 and 2026. Increase in incidence of skin diseases is expected to propel the market in the region during the forecast period. The market in Asia Pacific is likely to witness strong growth from 2018 to 2026, due to rise in adoption of aesthetic devices. Moreover, increase in focus of key players on expansion in the region, large untapped population, and rise in awareness about aesthetic procedures are projected to augment the medical aesthetic devices market in Asia Pacific. Key players operating in the global medical aesthetic devices market are Fosun Pharmaceutical Co., Ltd. (Alma Lasers), Mentor Worldwide LLC, Cutera, Inc., Cynosure, Inc., Lumenis Ltd., Syneron Medical Ltd., and Solta Medical, Inc. These players exhibit the widest geographical footprint, with presence in multiple medical aesthetic devices product segments.